Ben Teague provides professional consulting services to public and private property owners. Inspection & consulting services include limited or comprehensive testing for environmental contamination and exposure problems resulting from impacted materials containing carcinogens and/or biological hazards such as asbestos and mold. Environmental investigations are conducted using state of the art technology such as moisture and particle detection tools and equipment. Thermal imaging is also used to investigate and locate the source of hazardous microbial colonization's found inside buildings. All inspection services include the site visit and initial visual inspection, bulk and any air sampling as necessary, a written report including color photographs with a written explanation of all conditions noted, a lab analysis report with a written explanation of the lab results. This thermal infra red picture illustrate an in-floor heating system that is not working properly. This thermal infra red picture shows an in-floor heating system near the living room fireplace that is not working properly. This thermal infra red picture shows the energy loss at a gable vent. This thermal infra red image illustrates the heat from a fireplace damaging a television mounted above the mantle. This thremal infra red picture reveals a hot light switch dimmer. This thremal infra red picture shows some in-floor heat tubing under the bathtub leg, the contrtactor was about the screw a fastener thru the water tubing. This infra red thermal image illustrates limited heat loss from an exterior point of view. 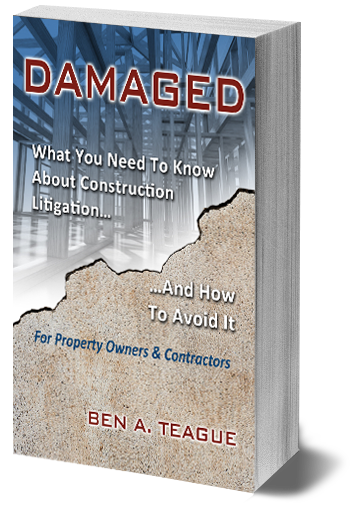 DAMAGED: What You Need To Know About Construction Litigation & How To Avoid It. Damaged will help property owners and contractors understand what the most common causes of construction litigation are, and explain how both parties can work together to avoid the typical problems that lead to litigation. 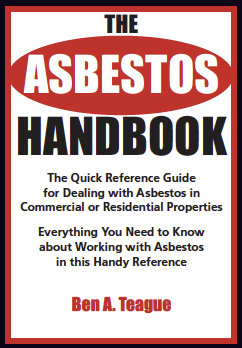 The asbestos handbook is written by Ben Teague to fill the void of general information needed for quick reference by anyone dealing with commercial or residential properties. Whether you are a real estate investor, construction contractor or office employee, you will find all the information you need to know about working with asbestos in this asbestos handbook. 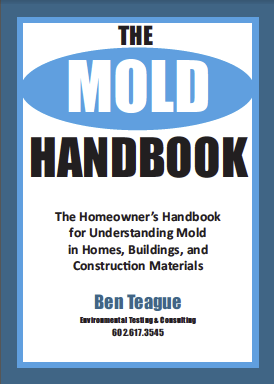 Ben Teague retains ownership of all written documentation produced by Ben Teague employees and inspectors, including but not limited to pictures, agreements, contracts, written reports, published editorials, web content etc. Payments for inspection services are for time spent to inspect or consult, and in no way constitute a transfer of document ownership to a client. The content of this site including but not limited to the text and/or images is not to be reproduced, distributed, or transmitted in whole or part by any means including but not limited to electronic transmission, photocopying, faxing, or any other optical or mechanical means. The use and distribution of Ben Teagues' documents are strictly prohibited unless written authorization from Ben Teague is obtained by the user. Copyright © Ben Teague, All rights reserved.